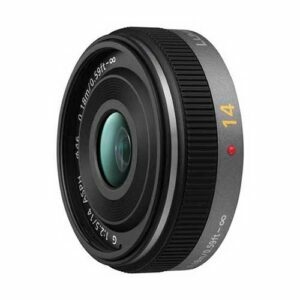 Lens Description: The interchangeable single focal length lens Lumix G 14mm f/2.5 ASPH features a 14mm (35 mm camera equivalent: 28 mm) wide angle and F2.5 brightness with sharp, high contrast image rendering. Taking advantage of the wide angle of view and deep depth of field, the compact LUMIX G 14 mm / F2.5 ASPH offers excellent performance in shooting not only landscapes but also snapshot or indoor shooting. Comprising of six lenses in five groups including three aspherical lenses, the lens system achieves both high compactness with short overall length of 20.5mm and high optical performance. It also excels in shooting subjects with components of straight line including architectures thanks to the minimized distortion. The integration of stepping motor and inner focus drive system realizes the use of silent, high speed contrast AF. Seven blades give the aperture a rounded shape that produces an attractively smooth effect in out-of-focus areas when shooting at larger aperture settings. Highly reliable metal mount assures durability for active use and uses multi-coated lens elements that minimize ghosts and flare to further enhance its shooting performance.